During Phase #1, our Heroes of the Storm team placed 4th during the season and narrowly missed out on the Mid Season Brawl. Our goal for the team is to reach BlizzCon, and we're ringing in some changes heading into HGC Phase #2. We'd like to announce that we are signing Liam "Arcaner" Simpson as our new ranged DPS player. Arcaner is arguably Australia's best player, and he will now be playing his preferred position so expect him to bring his game to a new level. To accommodate our new signing, Nurok will be moving to support. He will be taking over for Splendour, who will now be playing support for Monkey Menagerie. We would like to thank Splendour for being a big part of our team and providing a lot of stability in our play. We know that he will continue to take down more Nexuses in his career, and we wish him the best of luck in the future. "It seems I have big shoes to fill by taking over Splendour's position, but instead I'd like my own pair to be there to feel the most comfortable, play with confidence and become one of the best support players in our region. Someone once told me I should not try to be the best player on the team but instead be the best player for the team. Moving forward with these changes we will be a stronger team and I am especially happy to work with Arcaner in the upcoming months. We will work hard to reach our goal for this year: competing at Blizzcon." "I'm thrilled to have the opportunity to be a part of, and represent, Team Liquid and their Heroes of the Storm team. The organization has developed an incredible brand and I value that a lot, so for me it's an important achievement to be recruited into this environment. It'll also be exciting to finally be on my main role as ranged DPS and achieve some big goals and ambitions of mine, side-by-side with a professional and talented group of players who I'm eager to practice with. I'm thrilled to start this new chapter in my career. It means a lot to be happy and content every day in Hero League and scrims because I get to play the heroes I'm passionate about so I feel very optimistic for our success next phase." Our new signing will make his debut for Team Liquid during HGC Phase #2. 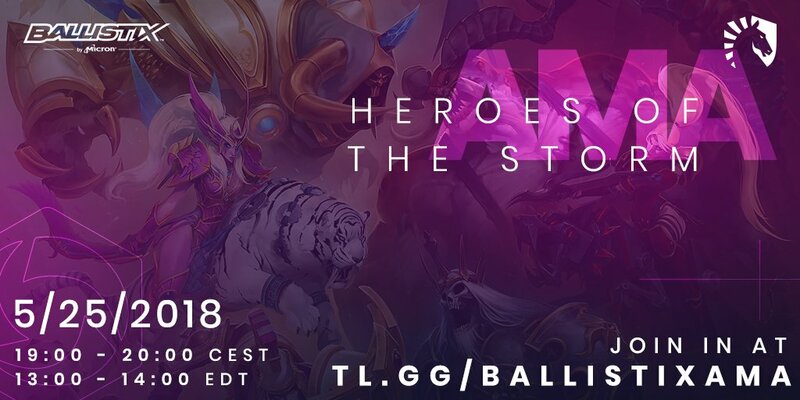 In the meantime, we are holding an AMA with our Heroes of the Storm team over on Discord! Make sure to hop in and say hello.